Insider Publisher's Note Hello, sunshine! Spring has arrived and the calendar is packed with events. It's back! Head to the Steveston Farmers & Artisans Market. Buy your tickets for the Rotary Club's Grapes, Hops & Bites Festival. The Richmond Cherry Blossom Festival takes place at Garry Point Park. Easter activities abound at our local heritage sites. London Heritage Farm’s plant sale returns. Celebrate Mother’s Day with a meal and shopping in the village. Late spring fun begins when Steveston Outdoor Pool and spray park open on Victoria Day weekend. Richmond Doors Open introduces its Living History program with historical demonstrations and costumed interpreters. The sexiest store in Steveston store has been going strong for 33 years! Bare Basics Lingerie is run by mother and daughter team Sandy Hosein and Nicole Stoltz. They are committed to providing high-quality, accessible lingerie whether you are a bride-to-be, nursing mother, recovering from surgery, looking for a sports bra, or updating your bra wardrobe. 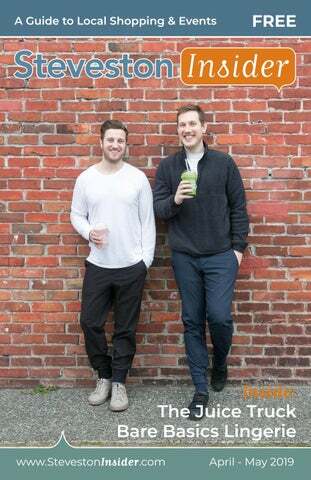 Our cover features Zach Berman and Ryan Slater, lifelong friends who successfully launched The Juice Truck in 2011. Their cold pressed juice bar was the first in Canada. From there they began opening cafés in Vancouver, including one in their hometown of Steveston in December 2017. Last year at this time we reported that Little Mexico Cantina was damaged by fire. The good news is they plan to reopen shortly! After 10 successful years in the village Gudrun closed. Nielsen & Company CPAs retired and closed their accounting practice. Newly opened is Something Sweet, Shift & Fitness, Terra Nova Midwifery and Red Ape Media. We anticipate the opening of Anar Persian Cuisine, Oxford Learning and Moncton Education. It’s time to get outdoors and work in the garden, take your bike out for a spin, dine on a patio, and take in all that Steveston has to offer. Enjoy exploring our ever-evolving village and remember to support the local merchants. 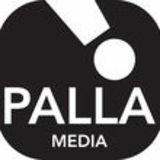 Palla Media | 11839 Dunford Rd | Richmond BC | V7E 3M6 Telephone 604-812-5658 | Email info@pallamedia.com No part of this magazine may be reproduced in any form - print or electronic - without the written permission of the publisher. Photos are copyright to Sandra Steier and are available for purchase. children can enJoy a scavenGer and eGG hunt on Note:	Special	Extended	Length	Swim	Only	scheduled	sunday. 4151 Moncton Street, Richmond, BCor call 604-276-4300. Find the schedule at Tel: 604-238-8030 The www.richmond.ca/aquatics 19th Annual Fitness Challenge starts January 1. Register today! Freshly made authentic Indian/African flavourful foods inspired by meals shared with family in Uganda. Visit Amin and Farida Sunderji this spring at Ember and discover the outstanding views paired with tasteful Indian cuisine. Open for Lunch & Dinner. Wednesday through Monday 12:00pm – 3:00pm, 5:00pm – 9:00pm. Closed on Tuesdays. Zach and Ryan had a vision to open a Juice Truck cafĂŠ in their hometown. Their dream became reality in December 2017 when they opened on First Avenue. Both Zach and Ryan grew up in Steveston. They met in grade 5 while playing soccer for the Central Richmond Ravens. Both graduated from Steveston Secondary in 2004. After graduating from university they took a year off to backpack through Nepal, India and Sri Lanka. While in Nepal they noticed that locals were drinking an orange beverage. had an architectural glass studio called Joel Berman Glass Studios and Ryan’s father, Alan Slater, operated Playboard Magazine, Vancouver's oldest performing arts publication. “It seemed second nature that one day we would start our own business,” Zach says. Zach comments, “It’s a full circle story, as we’re close family friends with Joy Stewart who originally opened Alegria Café and my mom, Sandy Postl, worked for years at the café. It was a special place. It was always very welcoming with warm food and good company.” “When the space became available, we wanted to continue the tradition of offering healthy food in an inviting space that always felt like home. The courtyard in the back always felt magical. We saw the potential to create a sanctuary where you could find some quiet, share some good food and good company,” he adds. From day one their business has been community driven. What makes The Juice Truck stand out? The new spring menu will be introduced in April. This summer The Juice Truck will host a vegan BBQ in the courtyard. Other exciting initiatives for this young company include the publication of a book with Penguin Random House, “The Juice Truck: A Guide to Juicing, Smoothies, Cleanses and Living a Plant-Based Lifestyle.” It features their recipes, their story and their values. With a smile, Zach says, “If you ever want to open a juice bar, all of our secrets are here.” Awards and accolades are plentiful. The Georgia Straight Best of Vancouver Awards and Golden Plate Awards have named the Juice Truck Best Juice Bar for seven consecutive years. Conde Nast Traveller named the business one of the Best Juice Bars in the world. Their Juice Cleanse has been featured on Gwyneth Paltrow’s website Goop, and on the Food Network’s show Eat Street. Zach’s wife Meghan works with the company; she also grew up in Steveston. Lauren Ho, director of operations, is one of their closest childhood friends from Steveston. Opening Soon in Steveston Village! IS NO STRONG BRAND “THEREWITHOUT A STRONG CULTURE. We’re serving good food with good friends Serving appies, burgers, salads, brunch and a kids menu. $11.50 Daily Lunch Specials. Great wine and beer menu. Fun and friendly service. location, still life, a tropical landscape or a garden. • Summer Cleaning • Moving In/Out Cleaning • Spotless Kitchen Cleaning • Blinds & Window Cleaning • Office Cleaning & more! Hello Spring 2019 Hairstyles! If you are looking for creative innovation, professional service, expert advice and highly trained stylists then ASK Hair Studio is the salon for you! Book your appointment today and find out why our award winning salon has been keeping Steveston clients looking modern and chic since 2006. - BOOK YOUR NEXT PARTY WITH US Sunday to Thursday 11am - 11pm. Friday & Saturday 11am - Midnight. TAX TIME IS FAST APPROACHING! Our office will be open 9am - 5pm Monday to Saturday until May 4, then by appointment. Elly Fenton and her staff proudly offer friendly, knowledgeable service at reasonable prices. Become a Stakeholder FREE ENROLMENT We love your business just as much as you do. If you’re ready to take the next step in growing it, join us. You’ll expand your network while gaining the tools to welcome more visitors. Your business is part of what makes Richmond such a great place to visit. Join Tourism Richmond and showcase it across the region and around the world. “Tourism Richmond understands my business and how to support its growth. They can do the same for you.” — Jim Van Der Tas, Steveston Restaurant Group Inc. In a year when the number of homes listed for sale was below historical averages, actual home sales in Metro Vancouver set a new record. The Real Estate Board of Greaterbring? Vancouver (REBGV) reports What will Spring that 2015 home sales were the highest annual total in REBGV history. This was powered early in the year by four straight months with more than 4,000 sales a month from March to June, another first for REBGV. This communication is not intended to cause or induce a breach of an existing agency agreement. This is not intended to be an offering or solicitation for sale. E. & O.E. April - May 2019 www.StevestonInsider.com This communication is not intended to cause or induce a breach of an existing agency agreement. This is not intended to be an offering or solicitation for sale. E. & O.E. In the mid 1980s Steveston resident Sandy Hosein was not aware the village was going to transform to become a destination known for its boutiques and restaurants, but she had a vision to open a shop where women could treat themselves to something feminine. Sandy quickly became an astute business owner and Nicole has followed in her footsteps. They are actively involved in making purchasing decisions together and recently returned from a buying trip to New York City accompanied by Nicole’s four-year-old son, Zachary. Nicole Stoltz, Sandy’s daughter, has been actively involved with the business since it opened. Nicole was 11 years old when she began assisting with gift-wrapping and at a young age mastered the art of bra fitting. “Bare Basics is Zachary’s second home. Spending time at the shop is second nature to him. Who knows, he may take over the business one day,” Nicole says with a laugh. A beautiful selection of bras and foundation garments can be found alongside loungewear, slippers, daywear and shape wear. annual Girls’ Night Out event held at the end of November is always a wildly successful evening for the shop. A highlight is bringing in Butlers in the Buff who model the Saxx products while serving refreshments and posing for photos and selfies. For the ladies, Hanky Panky underwear made in the U.S.A. with soft stretch lace in a variety of fun colours remains a staple in the store. Bare Basics beautiful window designs are the product of Nicole’s imagination. She has an innate talent for creating props and installations. based company creates lounge and sleepwear that moves you from street to sleep. Paper Label’s creations are made from Tencel, a fabric produced from sustainably sourced wood; it is more absorbent than cotton, softer than silk and cooler than linen. The oversize cardigans look great with a t-shirt and jeans, perfect for our West Coast casual look. Bare Basics is known for its professional and personal service along with a good dose of warmth and laughter. Their business is first and foremost about people and with this personal approach clients keep coming back. Nicole reports, “After 33 years in business we now have a third generation supporting our boutique.” She wants to ease the misconception that Bare Basics is a place for only mature women. Younger shoppers are delighted to discover they don’t need to travel outside of Steveston for lingerie or casual attire. TIME TO GET YOUR SAUSAGE ON! ASK A STEVESTON INSIDER My brain is always foggy and I never sleep well. What can I take? Something that can increase energy and nutrients to the brain and maximize deep, restorative sleep would be ideal. The unique blend of 16 supplements in Brain Evolve™ (by Bennett’s Choice), including creatine monohydrate, ginkgo biloba, quercetin, taurine, and N-Acetyl-L-Cysetine, D-ribose, melatonin, could do just that. The Epigallocatechin 3-Gallate, a green-tea catechin, and astaxanthin, a carotenoid pigment from shellfish and fish, serve as potent anti-oxidants. Brain Evolve™ also limits inflammation. Taken in the evening, it is NSF Certified for Sport as a concussion treatment product. Check out the line of Bennett’s Choice brain products such as Brain Beast™, which is a daytime formula great for energy and focus, at Pharmasave Steveston Village. Come talk to Fred, Integrative Health Pharmacist. Proud to call Steveston ‘Home’ As a local Steveston builder, we take a great deal of pride in the work we do in and around our neighbourhood. Our dedication to exceptional value and quality craftsmanship drives every project, and we strive to make community contributions that are signiﬁcant, meaningful and long lasting. Share the stories of Steveston’s Historic Sites | Greet visitors while dressed in period costumes. Demonstrate historic activities: shipyard wood working, butter churning, explaining tram car mechanics, sewing, and much more. No experience necessary! | Training & costumes provided. ASK A STEVESTON INSIDER Can compression socks help with my excercise/sports? Compression garments and socks offer support to the blood flow in our veins. Unlike arteries, veins do not have muscles built in, so as they bring the blood back to our heart, they rely on external muscles and valves inside to prevent blood back flow and clotting. Compression garments acts like an extra layer of external muscle that pushes blood flow upwards and prevents back flow at the same time. With an improved circulation, muscle functions improve, as a result, you can warm up faster and for amateur athletes performance can be improved up to 30%. In addition to improved athletic performance, compression garments also prevent injuries and improve recovery time. The added support prevents muscle vibration and reduces risk of injury during exercise. Make sure you see our certified fitters to find the best fit for you. Are you a vintage collector? Vintage lover? Hope to see you at our famous Curio Sale! Open daily 10am to 3pm. Sundays 12-3pm. and returning favourites to provide a sampling of some of the sites that make Steveston special. Starting at the west end of the village is the Gulf of Georgia Cannery National Historic Site (12138 Fourth Avenue). Built in 1894, this was once the largest cannery in the area. This year the Cannery is offering free 60-minute tours of their new exhibit, “The Cannery Cat.” This unique guided tour will trace the Cannery Cat’s footsteps behind the scenes of this historic salmon cannery. Pre-registration is required by calling 604-664-9009 after May 1. Four tours will be offered over the weekend: Saturday and Sunday at 10:30 am and 2:30 pm. Outside of these tours, normal admission prices apply to visit the Cannery building. Continue down Moncton Street to the Steveston Museum and Visitor Centre (3811 Moncton Street) Enjoy live music and join local artists as they create and display paintings, drawings and photography in the museum's Town Square Park with Steveston’s Lighthouse Collective. Inside the museum, sit in the bank manager’s office and try your hand at writing out a bank deposit slip, then hear the stories about the Japanese hospital and school while exploring the exhibits. These activities take place throughout the weekend from 10:00 am to 4:00 pm. the newly restored Tram Car 1220 and take a step back in time as costumed interpreters bring the Steveston Tram’s history to life. Hear stories of the daily passengers and discover where they were going and what personal items they may have carried with them on their trip. Tucked behind the Steveston Community Centre is the Japanese Canadian Cultural Centre (4255 Moncton Street). For over 25 years, the centre has been dedicated to the Japanese Canadian community who endured injustice during and after World War Two. Throughout the weekend from 10:00 am to 4:00 pm, enjoy displays, demonstrations, presentations and hands-on activities about the history, culture and traditions of Stevestonâ&#x20AC;&#x2122;s Japanese Canadian community. Jump in your car or on a bicycle and get creative while touring Branscombe House (4900 Steveston Highway) and discover what this year's artist in residence, Paige Gratland, has been creating with the community. History meets the waterfront at Britannia Shipyards National Historic Site. Experience history come alive and discover a wealth of activities that help tell the story of the people who lived and worked there. Learn about woodworking and sewing, play a game of majong or run down the boardwalk with a hoop and stick like children did 100 years ago. A 5-minute car ride away is London Heritage Farm (6511 Dyke Road). Tour the exquisitely furnished rooms of the London Familyâ&#x20AC;&#x2122;s 1890s farmhouse and stroll through the park to enjoy the heritage herb and perennial gardens. the chance for visitors and Richmond residents alike to participate in unique behind-the-scenes opportunities and to discover hidden gems in the community. Put aside a few hours on Saturday, June 1 and Sunday, June 2 to sightsee around our fabulous village. For more information, pick up a Doors Open Richmond 2019 map brochure from City facilities starting early May or visit the website at www.richmondmuseum. ca/events/doors-open-richmond. Must be over 19 years of age and have valid ID to enter. Drink responsibly and plan a safe ride home in advance. Part proceeds from these events will support the Richmond Christmas Fund and other local charities. ALL PROCEEDS GO TO RCM SAR RICHMOND! Come in and try our variety of teas and biscuits. Check out your British favourites. Many new products available. PROFESSIONAL HEADSHOTS Your face is your business and your brand. That’s why it’s important to have a professional headshot every two years. Office group rates available. In studio or on location. Contact Sandra Steier to book your new headshot. entertainment entertainment entert ainment entertainment all all day day with with lots lots of of prizes! prizes! TRIBUTE TRIBUTE TO TO DAVE DAVE BOYCE BOYCE 1938 1938 -- 2018 2018 Free Free Parking Parking at at the the Steveston Steveston Community Community Centre. Centre. HOT HOT WHEELS WHEELS Racing Racing in in the the park. park. Bring Bring your your cars cars or or use use ours. ours. Enter Enter to to Win Win FREE FREE Cars! Cars! Ask An Insider $250 (5”wide x 4”tall) Photography Package $250 Ad Design Package $160 Advertising rates are per magazine. Ads around the map are not guaranteed and are based on availability. All ads are full colour. We can assemble a simple ad at no cost with text and logo. Accepted File Formats: PDF files are preferred. Resolution for images must be at 300 ppi. Colour CMYK. Minimum 1/8” bleed. No border. Distribution is 10,000 copies All ads must be paid in full upon placement. May 11th & 12th at 10am - 5pm Featuring a selection of London Heritage Farm Perennials, Annuals, Herbs, Hanging Baskets, Tomato Seedlings, Succulent Arrangements and Garden Accessories. Free â&#x20AC;&#x153;Surpriseâ&#x20AC;? plant for each child at checkout! Draw for a chance to WIN a beautiful hanging basket! Reserve High Tea in the London Heritage Farm Tea Room. Tour the Museum and visit the Gift Shop.